Oana Stefan (HEC Paris) has kindly sent us a copy of her book on soft law in competition and state aid law. This book is the first monograph ever devoted to this issue. 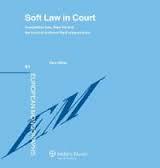 Amongst other things, the book uses quantitative data to confirm that the judgments of the EU Courts abundantly refer to soft law instruments. It also argues that the distinction between binding and non binding effects is too crude. Lastly, it shows that the EU courts have created legal hybrids when endorsing soft law instruments on the ground that they are the expression of general principles of law. This generates, in the author’s words, a “judicialization” of soft law. A must read. Apparently, Oana will in the future focus on how national courts deal with soft law instruments. A full description of the book can be found here. Two final remarks. First, I’d love to read Oana’s views on the appalling Expedia judgment (Expedia Inc v Autorité de la concurrence and Others C-226/11). Second, this book review does not mean that we are “sokolizing” this blog. Our tacit understanding with Dan is that he focuses on the scholarship reviews, we concentrate on the rest (including the nonsense).